Lonavala, a popular hill station, is a part of the Sahyadri ranges in Maharashtra. The scenic beauty and pleasant weather of this place offer a much-needed break for tourists who want to escape from the hustle bustle of city life. This enchanting getaway is surrounded by majestic mountains, dense woods, gushing waterfalls, lush meadows and historic caves, much to the delight of nature lovers. From adventure activities like rock climbing, camping and repelling to luxury stays and caving, this idyllic tourist spot comes to its full glory mostly during the monsoons. Lonavala lies enroute Mumbai to Pune. A cab from Pune to Lonavala roughly takes 1 hours 16 minutes, covering a distance of 66.7 km via the Mumbai Highway. In case you are travelling from Mumbai to Lonavala, affordable taxis are available that takes around 1 hour 48 minutes to travel a distance of 82.8 km reach Lonavala. Each exotic location in Lonavala has their own alluring charm and offer unique sightseeing experiences. The centuries-old Karla and Bhaja Caves are Buddhist holy sites that have intricate rock-cut architecture set against a picturesque backdrop. The Karla cave is the largest Hinayana Chaityas (temple) that has the Ekvira Devi temple dedicated to the local deity worshipped by the fisherman community. 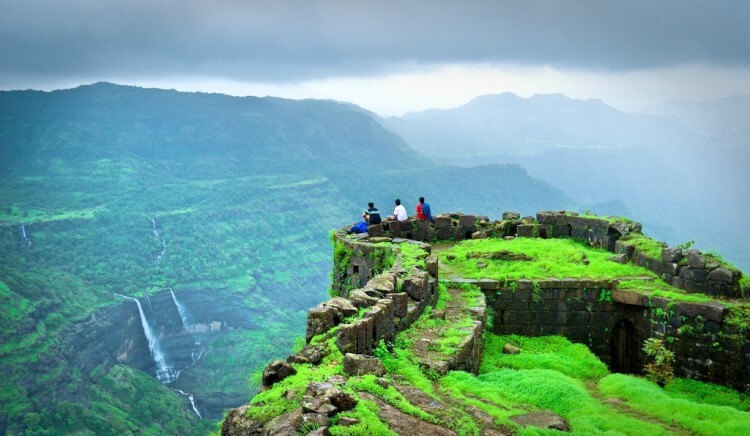 Tourists can trek up the Lohgad Fort up to the Vinchukata point to enjoy the mysterious beauty of the landscape. The Rajmachi Fort is a prominent landmark located on the Shrivardhan and Manaranjan Peaks. Trekkers can trek up its trail to catch a breathtaking view of Karanala, Bhimashankar, Matheran, Mahuli and Ulhas River. Natural shelters offer camping sites on this fort. The Tiger’s point is a cliff-top point with a drop of 650 m that provides an exhilarating view of the valley. Visitors find the Echo Point on the cliff quite fascinating. The resorts along the Pawana lake offer camping, fishing, barbeque along with a host of recreational activities for children. The Rajmachi Wildlife Sanctuary is a blissful haven where one can spot some rare species of flora and fauna on the foothills of Western Ghats. Tourists looking for new age entertainment must visit the Imagica Adlabs in Lonavala that cater to all age groups. The Celebrity Wax Museum at Lonavala Square Mall showcases statues of famous personalities under one roof. Lonavala is famous for its tempting sweet confectionery called chikki. Don’t forget to pack some for your folks back home. The Narayani Dham temple in Lonavala has a serene atmosphere with a canteen and lodging facility. Tourists who climb up the Duke’s Nose must not miss offering prayers at the Mahadeva Temple at its summit. Shri Durga Parameshwari Temple is also a beautiful marble temple sculptures in the South India style of architecture. Hire cabs to explore places around Lonavala in the best possible way. The local cab driver can give you interesting insights and can guide you to offbeat locations that may be more interesting than the conventional places.